Originally Posted by bigaudiofanat Where do you have your green wire connected? Is it connected to ground? If not ground that green wire. I got the green wire grounded already. Where do you have your green wire connected? Is it connected to ground? If not ground that green wire. I got the green wire grounded already. Hmm than it should let you see the video from the camera. Or it might be waiting for a signal from that reverse wire. But I am not sure. So you are sure the revers purple wire is not hooked up to anything? Also do you know how to use a volt meter? He is what I am thinking you should do. Go to your tail lights look at the owners manual on how to replace a backup light bulb. Take the light bulb fixture out and look at the wires. One of them has to be +. Find out which one by using the volt meter or just trying them one by one with the purple wire. Once you have found which one it is. Find it in one of the other areas and tap into it. I think you should be able to find it that way. Everything works fine now...connected red wire from camera to red on HU, purple/white from HU to red/black (at back up bulb) and left red/black from camera unconnected...I was trying to connect it somewhere all this time. Your advice definitely helped...thank you very much. No problem man. I am glad that it worked out for you. Props for getting it done right. Hope to get a few more installs before winter. Will have one or 2 posted here by the end of the month. 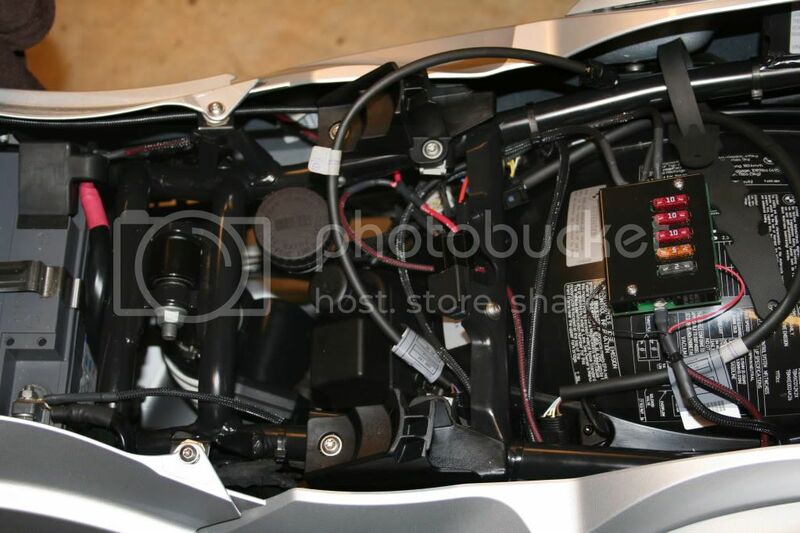 So my dad owns a 2008 BMW R1200RT motorcycle and he hats the electronic controlled fuse system. 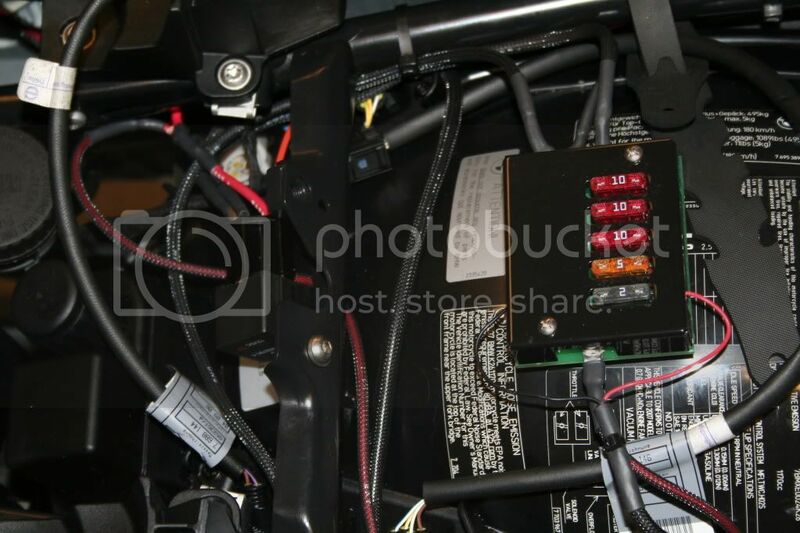 If you over load the circuit that it is programed for than it shut power off to it BMW calls it cambus. So he wanted to be able to add whatever he wanted to the bike without worrying about that. So I installed an aftermarket fuse block that has both switched power and constant ones as well. Enjoy the pics! 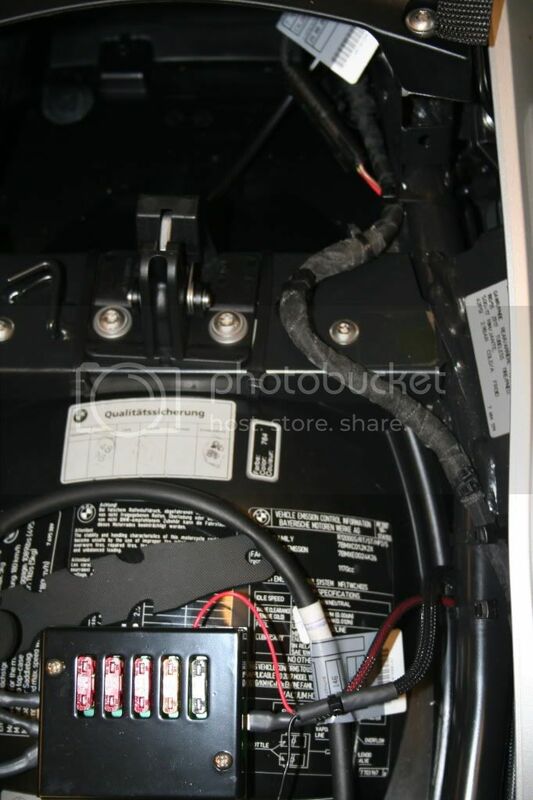 can you mount a fuse holder on the side of the battery? I've seen a few pics here of the fuse holder but most of the battery has a plastic cover on it. Mine doesn't have it. Will the battery heat up on long trip and cause the plastic holder to melt or whatever? Thanks for the help! Well the plastic holder is not on all cars. On ones that do not have it I usually make a custom bracket to hold it. The plastic cover is nothing more than a cover, the battery is not going to heat up from there not being one. Sorry for the delay. Also yes one can be mounted as long as there is a cover. No cover means you can not mount one on the side. Matt you are a pro. I just looked at some of your work, sweeeet.